FREE agent and office profile websites now available. Entegral has just launched yet another innovative product to make the life of SA's estate agents and agencies a whole lot easier. New profile websites for any agent or estate agency can now be setup within 24 hours free of charge. All that we require you to pay is the domain registration fee - hosting and setup are on us! What's great about these profile websites? This is an industry first, FREE websites for estate agents and agencies only pay yearly domain renewal fees starting from as little as R150/year for .co.za domains. No monthly hosting fees! Your branding including name, logo, featured properties and area links. Highly optimised SEO website that is continuously tweaked to increase your exposure and rankings on search engines like Google! Choose your own .co.za, .com, .net or .co domain name e.g. 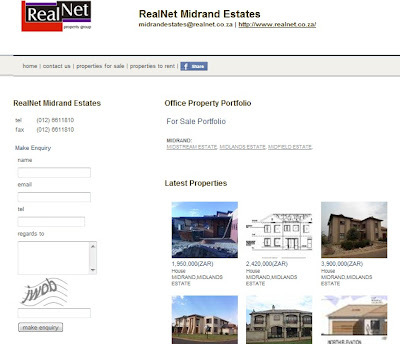 http://www.midrand-property-for-sale.co.za/. Choose any available .co.za domain, you can search on http://co.za/whois.shtml for available domains. Or choose a .com, .net or .co domain, you can search on http://www.godaddy.com for available domains. Ownership: .co.za, .com, .net and .co domains are registered in the name of the client and remains the property of the client. Entegral is the service provider and hosts the website. Ownership: property.co.za subdomains. Entegral owns all subdomains and it is leased to the client on 12 month periods. The client will have first option to renew a property.co.za subdomain.